As The Next 36’s ‘School for Gifted Youngsters’ Expands It’s Vision, One Question Remains: How Do We Judge Graduates as “Successful”? In a conversation with the Next 36’s executive director, I wasted no time asking what it’s like to be in such a formative position. After all, Claudia Hepburn is tasked with guiding 36 of Canada’s most decorated, high-potential undergraduate-aged future leaders every year. It’s a job that comes with its pressures, one would imagine. “You’re freaking me out now,” she joked with me. I prodded a bit more. 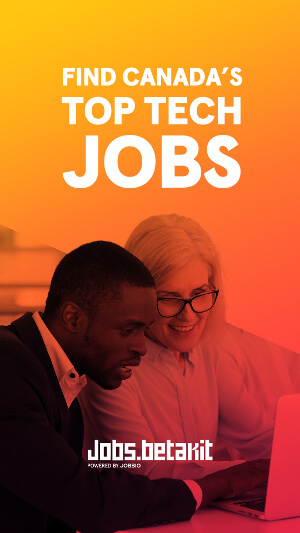 The stakes might not appear to be high, but these early twenty-something’s are all setting aside potential internships with Facebook and Google, well-paying jobs at respected firms and even their own ventures, to join the program. It’s nine months in a period of their lives where the sky is the limit, while they’re being pulled in every direction. And one might assume just as the Next 36 will demand a lot from them, they’ll be anticipating a life-changing experience. “It’s actually incredibly exciting and exhilarating,” said Hepburn, before saying that the program and its well-known founding patrons have created a “virtuous circle” of attracting not only the best young minds to join cohorts, but also great mentors, donors and universities who all want to help. “The beauty for me is the excitement of going out to the best business leaders and saying, ‘if you come and get engaged with the Next 36, you are going to have an outside impact in forming that next generation of entrepreneurs,” she said. 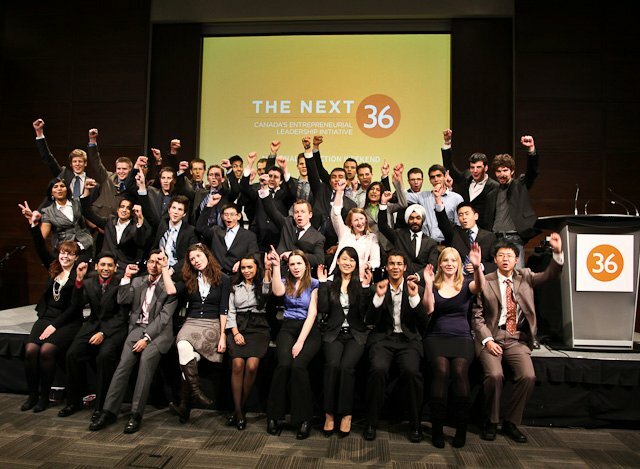 The Next 36 was founded in 2010 by Hepburn, a public policy specialist in education who previously lead the Fraser Institute think tank’s Ontario office; Reza Satchu, a successful entrepreneur, investor and entrepreneurship professor at the University of Toronto; Ajay Agrawal, a professor of entrepreneurship at the University of Toronto’s Rotman School of Business; and Tim Hodgson, a managing partner at an asset management firm and a former CEO at Goldman Sachs Canada. Hodgson also spent time advising the governor of the Bank of Canada. Together the foursome created the program to address what they viewed as a lack of high-impact Canadian entrepreneurs and “nation-building business leaders”. They sought out three wealthy founding patrons in Paul Desmarais (Power Corporation of Canada), Jimmy Pattison (The Jim Pattison Group) and W. Galen Weston (George Weston Ltd.) and designed the program based on Satchu’s “Economics of Entrepreneurship” course at U of T.
Now in its fourth cohort, the program commences each nine-month session by bringing 80 finalists to Toronto for “national selection weekend,” an intense three-day period that separates the 36 chosen ones from the rest. Everyone must pitch a venture and it gives the young minds a chance to meet their fellow cohort members, even forming ventures on the spot. Those accepted who don’t already have cofounders are eventually assigned partners, and off these arranged marriages go. Participants must be in the final two years of their undergraduate degree and they all receive up to $95,000 in funding. 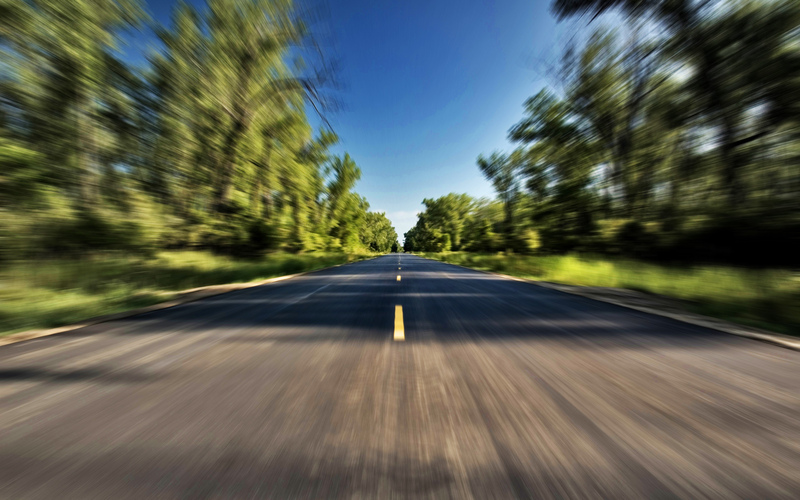 The Next 36 takes four percent equity from all ventures while its investor group including Relay Ventures, Slaight Communications and Alignvest Capital takes another four. 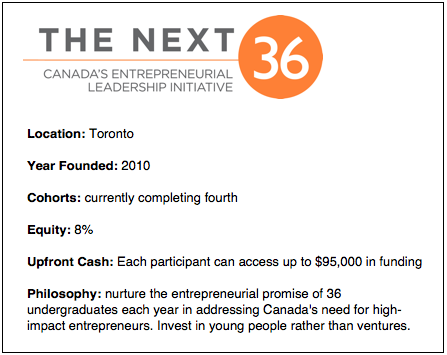 The Next 36 is a much different beast than Canada’s other accelerators though, who all may well be competing for the same bright young minds. The program mainly supports itself by a large network of donors, and in 2013 those deep pockets amounted to nearly $2 million in donations. As of August the program had just over $4 million worth of unrestricted net assets. It turns out there’s a lot of money associated with guiding Canada’s next generation of young leaders. Hepburn explained that the donors give because they’re in it for the long-term, willing to part ways with their money for the future benefit of Canadian prosperity. “That’s patient, philanthropic money,” she said. 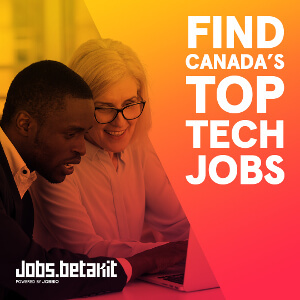 “They believe that by giving these bright young people a transformative, hands-on entrepreneurial experience at a formative period of their life, that 10, 20 years from now Canada will reap the benefits. 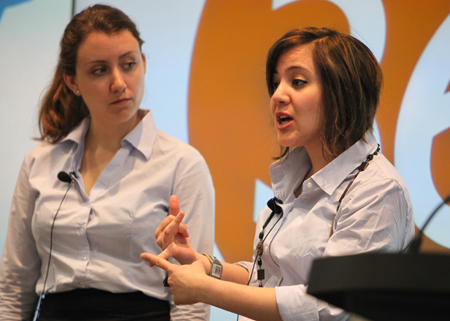 She also said that the program is actually at a disadvantage compared to Canada’s other accelerators. It doesn’t place equity bets on ventures, but rather on high-potential young students who often don’t have a venture upon joining the program. “Having said that, I think our results stand up to the best of the other accelerators,” she said. 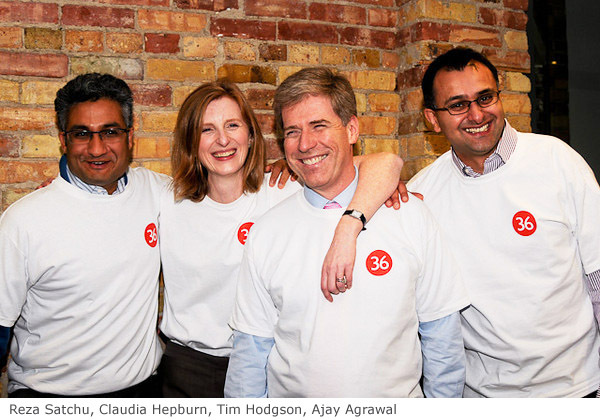 In 2014 the Next 36 has the reputation, the high-profile investors, the mentors and all the positive press a program could hope for. The donation cash flowed in last year and as Hepburn assured me, the donors aren’t in it for a quick buck. And while it is a charity, it’s also a venture-backed program that’s still taking equity from every idea, using up a ton of money and resources along its way. It would be naïve to think that there’s not some expectation that these young minds should create returns, both financially and not. 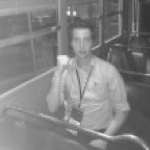 So how does the Next 36 judge its cohort members as successful? Hepburn admitted it’s a question that they struggle with, as often it’s too early to gauge success after the nine-month program. Some of these entrepreneurs haven’t even reached their 22nd birthday following graduation, another point that makes the Next 36 different from most accelerators who can usually judge “success” within the year. Some graduates go on to do their PhD’s, take positions at respected firms, or take other paths that can’t immediately be judged. “Getting a Rhodes scholarship doesn’t mean you’re a success or a failure from our standpoint, it’s what you do with the combination of being in the Next36 and the Rhodes, do you use those experiences to help you two or five years later.” (The program does actually have one alumna from 2011 who is currently studying at Oxford University on the Rhodes Scholarship). She called Stephen Lake “the most obvious” of the successes, but largely it seems that at this point no one knows what the barometer even looks like. Likely it’ll take another five to 10 years before we can assess the Next 36’s effect on these young minds. Small changes are on the horizon with the Next 36, which earlier this month introduced a new program to its arsenal called “The Next Founders”. It’s a free program for 20 startup founders to join an executive MBA-like curriculum, featuring 50 hours of master’s level education taught by faculty from Harvard, MIT and Richard Ivey. It’s designed for those without formal business education, there’s no age restriction and no equity is taken. A pilot program completed last year featured Bionym, WhatRunsWhere, Finmaven and a few other Canadian startups. This year’s program accepts applications until March 11. Have you checked out the rest of the series?